Across East Africa, more than 100 million people depend on maize as a staple food. Sorghum and groundnuts are other vital sources of food here. But maize, sorghum and groundnuts are susceptible to accumulation of aflatoxins, chemicals produced by a fungus that are toxic when eaten. These chemicals can cause cancer, are lethal in high doses, and may suppress immune systems, reduce nutrient absorption and stunt the development of infants. Aflatoxins are estimated to contaminate 25 per cent of the global food supply, with 4.5 billion people–primarily in developing countries–exposed to high, unmonitored levels. Aflatoxin-contaminated foods also restrict trade. Tightened European regulations, for example, were estimated to reduce African exports of cereals, dried fruits and nuts by USD670 million. Scientists across the region are taking steps to address the threat aflatoxins pose to food safety, and thereby to food security. Capacity and Action for Aflatoxin Reduction in Eastern Africa (CAAREA) is one such initiative. Led by the Biosciences eastern and central Africa-International Livestock Research Institute (BecA-ILRI) Hub in Nairobi, Kenya, CAAREA has established the first shared regional mycotoxin analytical platform. ‘Through this program, researchers combating the scourge of aflatoxins in African food and feed supplies have access to the tools and capacity they need to help them tackle the problem’, said Jagger Harvey, a scientist at the BecA-ILRI Hub. 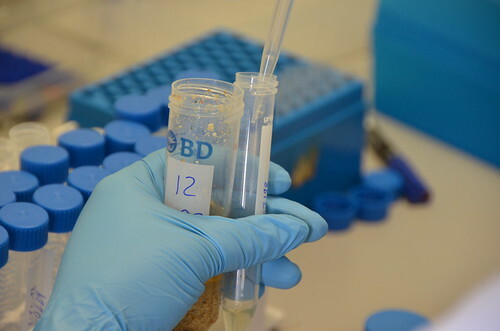 The mycotoxin platform, established with funding from Australia, is developing cost-effective methods to detect aflatoxin contamination in maize and maize products and developing and deploying a range of tools to reduce aflatoxins in the food supply. Read a brief about this program: Strengthening regional research capacity to improve food safety. Read a related ILRI news article and view filmed highlights from a media briefing on aflatoxins in Kenya held in Nov 2013. Read a series of 19 briefs released Nov 2013 by the International Food Policy Research Institute (IFPRI) and its 2020 Vision initiative jointly with the CGIAR Research Program on Agriculture for Health and Nutrition (A4NH), which is led by IFPRI, with a component on Agriculture-Associated Diseases led by Delia Grace, of ILRI. Grace co-edited the series of briefs, co-authored the overview (Tackling Aflatoxins) and wrote the brief on Animals and Aflatoxins. Two other ILRI scientists, Jagger Harvey and Benoit Gnonlonfin, of the Biosciences eastern and central Africa-ILRI Hub, in Nairobi, Kenya, are two of the authors of the brief on Improving Diagnostics for Aflatoxin Detection. Photo caption: A researcher preparing maize seeds for an aflatoxins test at the BecA-ILRI Hub laboratories in Nairobi, Kenya (credit: ILRI/Paul Karaimu). Tags: aflatoxins, CAAREA, Jagger Harvey. Bookmark the permalink.